Paraguayan President Fernando Lugo was ordained a Roman Catholic priest in 1977, and spent the first five years of his priesthood as a missionary in Ecuador. Working among the impoverished, he became an advocate of liberation theology (briefly, the interpretation of Christian ethics from the perspective of the poor, oppressed and victimized). When he returned to Paraguay, he spoke out against the iron-fisted dictator Alfredo Stroessner, and was unofficially but promptly expelled from the country. He spent the next several years working at the Vatican, and returned to Paraguay in 1987. In 1994 he was promoted to Bishop of San Pedro, one of the poorest areas in the country. Lugo's support for his nation's landless peasants, occasionally even speaking at their protest rallies, earned him the nickname "Bishop for the Poor", but the Bishop was no saint: He has admitted seducing a 16-year-old girl and fathering a child with her in the late 1990s, and two other women have claimed that Lugo fathered their children. He became nationally known in March 2006, when he led an opposition rally in the nation's capital, Asuncion. 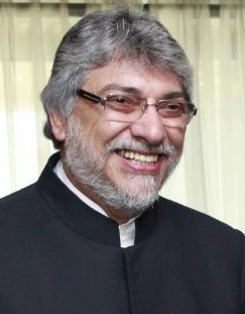 In December of that year Lugo resigned the priesthood to pursue the Presidency, vowing to change Paraguay's international reputation as, in Lugo's words, "the country of drug trafficking, corruption and illegality". Both Paraguay's constitution and the Roman Catholic church bar clergy from holding high office, but Pope Benedict XVI at first refused Lugo's resignation, instead responding that the priesthood was a lifelong commitment that could not be walked away from. After some criticism of the Vatican's Mafia-like position, in July 2008 Benedict issued an "unprecedented waiver" stripping Lugo of his clerical status. Backed by a broad alliance of political groups, Lugo was elected on 20 April 2008, winning a 42% plurality against two other major candidates. He took office on 15 August 2008, 31 years to the day after his ordination, ending 61 years of authoritarian one-party rule. Although unanimously proclaimed a radical leftist in most mainstream media reports, Lugo has said he considers himself a moderate, and he has publicly stated that he shares few political perspectives with the region's most famous radicals, Bolivia's Evo Morales and Venezuela's Hugo Chavez. His most often-repeated campaign pledge was to increase the rates charged to Brazil for power generated in Paraguay's two large-scale hydro-electric projects. As a lifelong semi-celibate Lugo is unmarried, and his sister, retired schoolteacher Mercedes Lugo, handles the ceremonial duties of Paraguay's First Lady. In the summer of 2010 he was diagnosed with non-Hodgkin lymphoma, a cancer affecting the lymphocytes, or white blood cells. He has undergone surgery and is being treated with chemotherapy. His doctors say, at least publicly, that his prognosis is good. Complaints of poor performance hampered Lugo's administration. A tipping point was reached when demonstrations by farmers over evictions became violent in 2012, with 17 protesters killed by police. As a result, he was impeached, and resigned office. Lugo called the impeachment an "express coup d'etat", but accepted the result. Vice President Federico Franco assumed office in the aftermath.